Our eyes are our windows to the world around us, yet they are also susceptible to all kinds of threats that could damage or alter our vision health. Now that summer’s here, the risk for eye damage is significantly increased. If you’re like most people, you’ll be engaging in intensified outdoor activities and travels this summer. While it’s fun and invigorating spending time outdoors, in the sun, and in the pool, there are several precautions you’ll want to take to protect your eyes and maintain your overall eye health. At Crescent Eye Care in Charleston, helping you achieve and maintain optimal vision health is our main concern. In the first installment of our Eye on Vision Health series, we’ll discuss three simple, yet effective ways that you can protect your eyes on a daily basis, without interfering with your summer adventures. 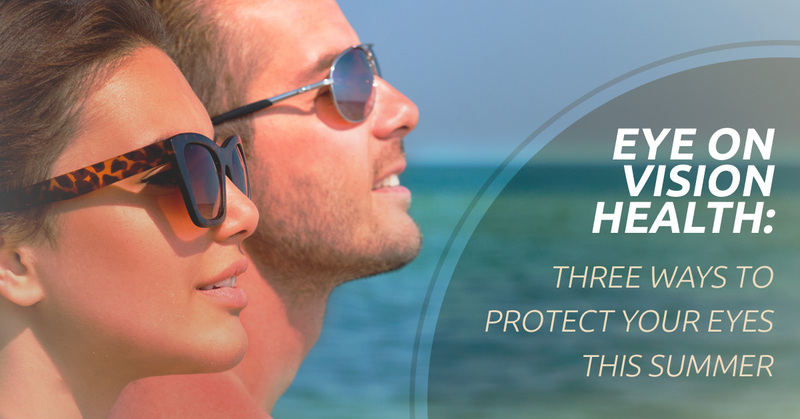 One of the most important steps you can take in protecting your eyes is to shelter them from harmful UV rays. Like skin, our eyes are at risk of sun damage from ultraviolet radiation (UVR) produced by the sun. The most obvious way to protect our eyes from both UVA and UVB exposure that causes such conditions as photokeratitis (sun blindness) is by wearing sunglasses. The key here is that you wear sunglasses with total and complete UV protection. It’s easy to assume that this means you’ll have to purchase expensive sunglasses: The good news is that there are many affordable, efficient brands out there with 100% UV coverage. You can protect your eyes without breaking the bank! Another helpful way to shade your eyes (and your head and face) from harmful UV rays is simply throwing on a hat. The hat’s bill will help keep your eyes shaded with or without your sunglasses. There are a number of ways to protect your eyes while swimming at the pool or simply relaxing poolside, while soaking up some rays. As already mentioned, it’s important to protect your eyes from powerful UV rays by wearing sunglasses, but did you know that the sun’s bright reflection off of water can also damage your eyes? It might seem like the glares you catch off of water are simply a nuisance that can temporarily obstruct your vision, however, repeated exposure to brilliant glares can cause long-term damage to your eyes. Make sure to keep your shades on as much as possible to avoid overexposure to the sun. Even keeping your hat or visor on while in the pool will help minimize reflection intensity. Additionally, while pool water is treated with chlorine to help protect us from germs, the powerful sanitizer often irritates the eyes, causing redness and burning that can last from a few minutes to, in more severe cases, a few days. It’s best to protect your and your children’s eyes from chlorine by wearing goggles. Remember, this advice applies to all bodies of water, including lakes, ponds, rivers, and oceans. Also keep in mind that these natural bodies of water are full of different bacteria and contaminates. Should you experience any pain, discomfort, or vision loss from any of these or other activities, call the eye professionals at Crescent Eye Center immediately. Summertime is a lovely time to garden, clean up the yard, and build things for the house. That means you’ll be exposing your eyes to debris, pollen, and probably sharp tools. An easy way to shelter your eyes from these threats is by simply wearing sunglasses. But sometimes these activities require a little more eye protection. Pick up some safety goggles from your local hardware store; some brands are even tinted and/or UV protected, adding an extra barrier from the sun. The great thing about goggles is that, unlike most sunglasses, they completely encapsulate your eyes and eye sockets, protecting not only your eyeballs, but also the the sensitive areas around your eyes. As far as pollen exposure goes, sometimes wearing shades or goggles helps minimize the exposure to irritants that often trigger runny, itchy eyes. It’s good to have eyedrops handy to offer some temporary relief when working in the yard or gardening. We hope you’ve enjoyed the first installment of our Eye on Vision Health series. Check back with us again for more helpful tips and advice from our eye care specialists. And remember, the best way to achieve optimum vision health is to maintain regular visits and eye exams with Crescent Eye Care in Charleston. Enjoy the start to your summer!